I and my spouse, Herman, have been RVing since 2010. We bought our first RV because our good friends, who have RVed for 15 years kept telling us how wonderful it was. They were right! We love it. 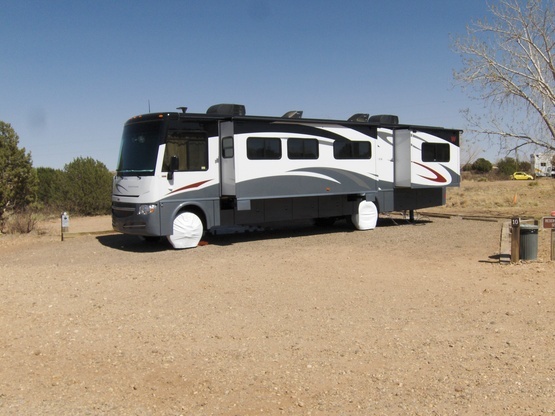 We like to take the RV and go to one of New Mexico's beautiful state parks and just relax. Spending the days hiking, reading and doing nothing. Since we are both retired. We also like to do what is called part-time/full-time travel in our RV. Often traveling three to four mounts a year in the RV. Joe retired in 2000 as a computer consultant to small business. While I can still find my way around a PC OK, time and technology have left my knowledge a little old and rusty. Since retiring I have turned into a half way decent stock market investor. I am not looking to get rich quick but, have managed to grow our investments nicely over the last 15 years. Herman retired in 2017 after 33 years with IBM. He was an Information technology consultant to Fortune 500 companies. For beginners to Rving we are happy to answer any questions. Since we started RVing in 2010 we have certainly learned from our share of RVing mistakes. If we can help or offer advice, please ask. We have a dog named Pepper. He is a mix, Border Collie, Australian Sheepdog, and Blue Heeler. He was born on May 29, 2010. He weights 73 pounds. He is very friendly with adults and children. With other dogs, he is friendly sometimes. It all depends on the dog. He is an inside and outside dog. When out side he roams free on our 40 acres. If you are traveling with a dog, we need to talk first on the phone before your stay. It is at 6,400 feet elevation. There are 12 sites well spaced. There is a horse corrals at the top of the loop. The loop has vault toilets. The only draw back is the last 7 miles are unpaved. The road is gravel and usually in good condition. We have a 2012 Winnebago Sightseer 36V. It is a class A and is 37.5 feet in length. It has two slides on the drivers side. One in the main cabin and a bedroom slide. Great site with great hosts. Definitely a spot you won't regret. These hosts are wonderful. They are generous and the conversation was easy. When we finally retired for the night, the area was dark and quiet. This host is easy to get in touch with and gave excellent directions. Joe graciously let us stay at their beautiful location even though it was Valentine’s Day. He greeted us in the rain to guide is in, show us the hook ups, and ensure we were settled for the night. The views in the morning were well worth the few miles off I40. We wish we could have stayed longer, but the rain/snow we woke up to urged us on our way. We enjoyed our time at JoeSams, it was quiet & quite beautiful. They were very respectful of our privacy and offered great tips on area attractions. Full hookups-definitely a bonus! And we loved their dog Pepper! Thanks so much for opening your yard for an overnight stay. Great hospitality and very cordial hosts in a super ranch like setting...really enjoyed it. Windmill camp. We had the pleasure of stopping twice in the last week with JoeSam. We were greeted with smiles and an offer for Happy hour. They made wonderful refreshments which made the road miles and fatigue disappear. We are newbies and received more helpful information than was humanly possible to assimilate. You know you have special hosts when they not only helped with a black water disposal, but actually did it while we watched. They also suggested additional items to make the experience easier. We will definitely look forward to our next visit. I am under the influence of Joe's excellent Manhattan as I write. This is a delightful stop. The parking area is graveled and level and they offer fhu incl 30 amp. They would not except a bottle of wine we offered nor any dip, but served us nice drinks! Far beyond expectation! They are 10 miles or so off I 40. Certainly will stop here again when we are passing, unless they are off RVing themselves. We stayed here in mid-March 2017 and can definitely recommend them as the type of hosts you would want to meet in this blind-date situation. 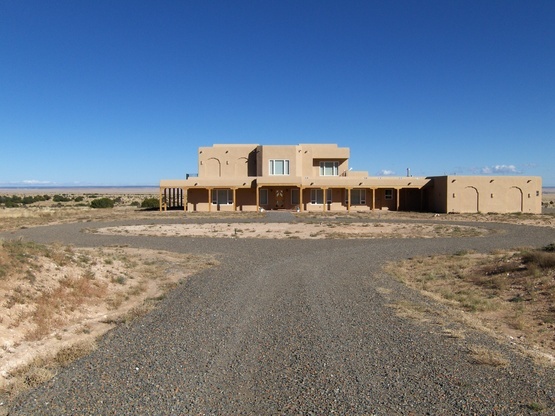 They were particularly helpful in recommending the places to visit in NM. The view from their home is serene and Pepper the dog is as good companion as you could want. Traveling east with our two oldest children. We stayed here for one night arriving late. We were welcomed immediately by Joe and his dog Pepper. Nice quiet area with water, electricity, and bonus dump station! Thank you for your hospitality! The hosts and their dog were very responsive during the confirmation period and wonderfully hospitable once we arrived. We loved getting to know them and walking the beautifully scenic property around their house. Recommended if you're passing through central NM! This was my first experience and I got in with a couple that wide opened their arms to me. I stayed for 5 nights! Joe was so patient. They invited me for happy hour the very first day and for dinner (my Portuguese cooking) on the last night. The space is huge, with water electric AND dump available! The backyard is a large extension of the high desert, with cow paths to meander thru. Their dog, Pepper is lovely, but I was afraid of having my little poos to socialize with him (after all, it's his property and he does a good job guarding it), so we just kept calling each other whenever I needed to walk them out. This was an awesome experience, mainly if you like isolation. Joe and his dog, Pepper, are quite the pair and treated us kindly. We truly enjoyed our time with Joe and Pepper. The property is scenic, quiet and calming. Joe knows a lot about these lands, and he will share his insights. In the mornings and afternoons, Joe and Pepper hike the trails, and you may join them. We hope to be back this way some day and perhaps attend another genuine Joe and Pepper happy hour. We enjoyed being with Joe (Herman was away) and Pepper. We shared dinner and storied together over some great wine. We certainly hope to rendezvous with them on the road. Interesting gent and Pepper did make himself welcome in the RV - inspite of the other dog who sort of looked at him - "Yo bro?". Great views, warm friendly host and dog (Pepper) matched his owners style. Set up with water, electric and sewer was well maintained and worked great. Enjoyed nice conversation with Joe who was very knowledgeable about traveling in New Mexico. Gave us some great tips only locals would know. Joe is a fantastic host! He is a wealth of knowledge on the area and he recommended things to do and see. We throughly loved chatting with him! And Joe's land is as amazing as he is. The views are FOREVER and amazing every way you look. Beautiful mountains to the west and it seems like you can see all the way to the Atlantic Ocean when you look east. The sunrise was absolutely beautiful. Do not miss this stop! It ranks as one of our favorite places so far! PS: Pepper, their dog will make himself home in your RV :) which we LOVED! We just received a response from Joe that he did not receive our request to visit them in April, 2016. He was most apologetic and extended a sincere invitation to visit them the next time we travel through New Mexico. Having read the recent comments of recent boondockers at Joe & Herman's we know that we lost out on a great experience. We will be sure to follow-up and visit next time we're in New Mexico. However, we did travel through NM via Silver City, then north to Grants and then N.E. through Los Alantos, Taos and Raton finding the locals most friendly and BLM staff welcoming and helpful, when we stopped, looking for Boondocking sites. Now back in Ontario we look forward to hosting at our home in Thornbury, ON which is on the shores of Georgian Bay with lots of hiking trails, good fishing, vineyards and public beaches to keep you busy. Check out our profile. They were almost our hosts.